Ecomuseum means “heritage”, “territory” and “population”. It’s a “pact” with which a “community” is committed to “take care” of a “territory”. Those terms are loaded with meaning: “community” is not only an institution, but the citizen as well. – “Take care” is also know how to preserve, for today and for the future, their cultural heritage in order to increase the value instead of consuming it. – “Territory” is not only in literal meaning, but also as a story of the people who live there and the signs left by those who have lived there before. 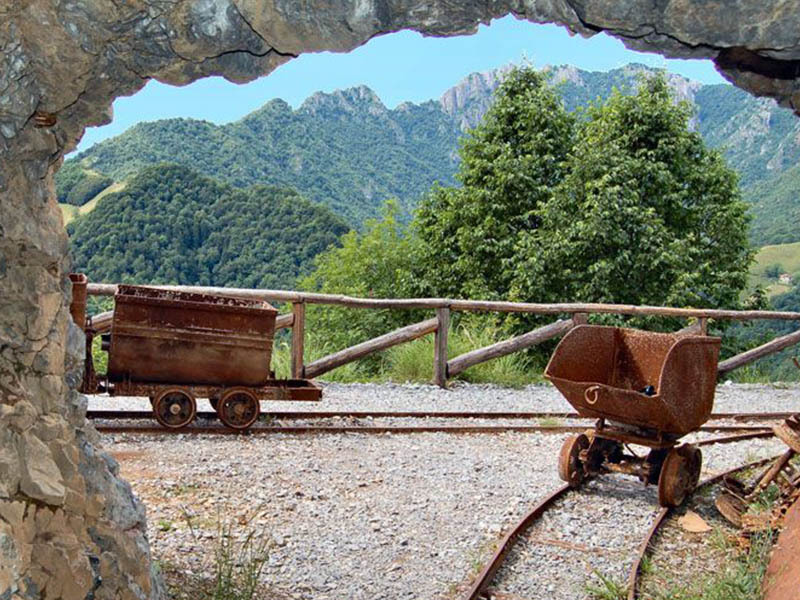 The Ecomuseo Minerario di Gorno (“Gorno’s Ecomuseum Mines”) – was born having the aim to safe the local community’s connection with their roots, their history and traditions. The most important activity of Gorno’s community was quarrying. But the mining world has always been deeply linked to the country: the miners out of the tunnel looked after the cattle, produce cheese for the family, “went” for firewood and herbs, the prey for every spiritual and material needs the saints of the tradition. To investigate the rich cultural heritage and landscape, it chose to weave themes that apparently seem disjointed but that refer to the same area: the interaction between man, work, mountain and its spirituality. Zinc mines of Gorno were known and exploited already in Roman times when the condemned were sent up here to “tear out metal.” On April 9, 1482 the Venetian Republic authorizes the reopening of the mines. In the 1500s were still efficient, in fact the mines were visited by Leonardo da Vinci as a government engineer. In the mid-nineteenth century zinc mines are industrially exploited and also in Gorno there was mining concessions. Since the beginning of the ‘900 many mines operated in Gorno and produced tons of blende and calamine. With ups and downs, including crisis and difficulty, mining in Gorno continues until 1981. From January 12, 1982 it is permanently close. The City of Gorno has a land area of ​​9.87 sq km, a maximum height above sea level in 5577 feet and a minimum of 1509 feet. Belong to Gorno the pastures of Grem, in the municipality of Oneta and Zambla, co-owned by Colzate and municipal district of Oltre il Colle. The pastures of Grina, Golla and Grem mountains can offer as well as stunning views, other reasons of attraction as the beautiful pools of watering where on clear days the surrounding mountains reflect themselves; nature offers beautiful alpine flowers, such as edelweiss and rhododendrons. The camps here located on these mountains allow to hikers moments of leisure and real refuge in case of sudden weather changes. The parish church of Gorno is ancient and was dedicated to St. Martin Bishop. It been heard as far back as 1344, when the parish priest was don Alessio Guerinoni, a native of the country. The current parish church was consecrated by the Bishop of Bergamo October 23, 1932. In addition to the parish church Gorno has other churches dedicated to SS Crocifisso, San Giovanni, Sant’ Antonio, Madonna delle Grazie, San Rocco, San Mauro and Santa Trinità, in addition to the church oratory. The village of Gorno consists of districts, once connected by old trails, today became driveways. The tiny village Villassio, situated at 2329 feet above the sea is the capital; other districts are: Erdeno, Riso, Cavagnoli, Calchera, Peroli Alti e Bassi, San Giovanni, Sant’ Anthonio, Campello. In addition to the districts, several other locations formed Gorno.